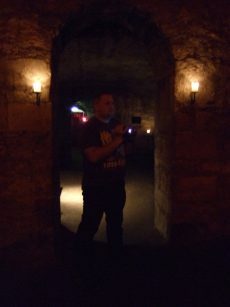 Unbelievable as it sounds myself and Jan are standing just outside the entrance to the Blair Street vaults, we have been invited by the owners Mercat Tours to take part in our very own ghost investigation. 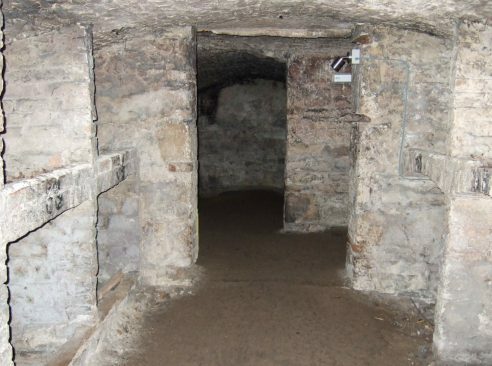 Treading in the footsteps of ‘Most Haunted’ and more recently ‘Ghost Adventures’, we were to be given total freedom to investigate these amazing vaults. This was to be the biggest and most intense investigation that we have ever undertaken. We bought with us our basic kit which consisted of K2 meter, MEL meter, camera, IR camcorder and an extra IR lighting module. It must be said that before the investigation I watched the above mentioned shows – if anything to see just what we would be facing. Jan on the other hand, refused – wanting to only take on what she faced at the time. 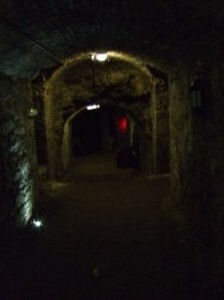 It seemed the vaults could well be teaming of spirits, we have ghost dogs, a small boy, an evil spirit and even sightings of Burke and Hare the famous body snatchers. Our contact at Mercat the lovely Joyce Clark, warmly invited us down the steps into the vaults. Joyce explained a little of the history of the location – and what to expect from some of its more ghostly inhabitants. We were on our own from here on in, just myself and Jan -underground in the world famous Edinburgh vaults. Sometime within the next few minutes Jan reported a tug on her trouser leg. A strong, firm tug -between her ankle and knee. Considering her trousers were made of a pretty tight fabric, it would have taken quite a lot of effort to displace them. No visible signs of anything that could have snagged them seemed apparent in the area. Unfortunately for us this had happened so soon, I hadn’t even finished setting up the camcorder. Quite wet, it seems that water regularly seeps from the ground above – and can cause quite a problem in the vaults below. We could hear drips and splashes from the vault rooms surrounding us that could quite easily sound like tapping to the untrained ear. Luckily for us most of the basic floor lighting and emergency lighting was to remain on as most of the floor area was uneven. I certainly didn’t welcome the challenge of having to move fast holding a camera and lighting rig in the dark. We spent our first hour wondering around the vaults taking base readings and reference pictures with the camera, all seemed quite normal. I ventured into Mr Boots room -but again nothing to report. It is only when reviewing the video tape afterwards do we hear our first EVP. We setup some trigger objects where the spirit of a small boy is often sighted. It was my idea to use some glow-in-the-dark marbles, if they moved – I should be able to pick them up easier on the IR camcorder. We took a short break to recharge our batteries -and grab some fresh air. Upon our return – and with the marbles not moved – I decided try my second experiment, playing some Scottish bagpipe music from my phone. Before our visit I had the idea of playing something that could echo around the vaults and hopefully charge up the energy. NOTE: Looking back at the footage afterwards, you can clearly hear a dog bark – another spirit that is quite common in these vaults. The music worked.. almost instantly the temperature dropped around us, suddenly we started to pickup spikes on our EMF equipment that were not there before. We ended up having a conversation with what we believe to be the spirit of the little boy. Using the lights on our EMF meter, we asked him to reply by lighting them up for a YES answer and moving away (turning them off) -for a NO answer. Although the replies were a little hit and miss – something was trying very very hard to communicate with us. For us it was a first – here right in front of us, was some sort of energy/spirit! Jan reported her left hand being much colder than her right, which I could feel for myself. Could the boy have been holding her hand? The K2 questioning carried on for around 10 minutes, before eventually the energy finally dissipated. Both myself and Jan took it in turns to perform solo investigations in various parts of the vaults. I opted for Mr Boots room, Jan in the bottle store room. Try as I might, Mr Boot’s just wasn’t interested in anything I had to say. I don’t believe in angering spirits as some investigators like to do -unless I have good reason too. After all people still have to use the premises after I’ve gone, it’s not right that I stir things up for them. Mr Boots – so called due to his heavy footsteps, has over the last few years made a good job of scaring people out of his room – but I have to say I felt quite at peace. At one stage I was actually sat on the floor, enjoying the experience. After coming out of the room and making my way to meet up with Jan, I happened to notice that my k2 meter was registering a high energy spike. Sweeping it around the area – it seemed only to register the spike directly infront of me. I came to the conclusion that something was stood face-to-face with me. With my investigative hat on I checked the area for any interference from local power sources such as lights. Just as quick as it appeared, it dissipated into nothing. Being stood right at the entrance of Mr Boot’s room you can’t help think that maybe it was him in person. I Don’t think I said anything to anger him, so maybe he was just giving me a warning shot. Meanwhile Jan in the bottle store wasn’t having much luck with any sort of contact, infact it seemed quite flat. Jan took the IR camcorder from me for some solo filming in the largest of the vault rooms, where we previously had our encounter with the spirit of the little boy. Meanwhile I decided to investigate the far corridor that is rumoured to have connections with the infamous body snatchers Burke and Hare. Once again.. something was registering on my K2 meter, I called Jan over but it quickly died away. It was nearing the time for us to end the investigation, so with one last hit we would do a quick sweep of the entire vaults before calling it a night. I had just about reached the stairs of the vaults when the K2 started to go off again. Not around Jan -who was infront of me -but behind me. Furthermore it seemed like a small pillar of energy, I tried walking away from it -infact I walked through a further 3 rooms with this energy in tow. Using the K2 I managed to narrow down the energy source, tracing out a size and shape. It was around waist high -which put it as either the boy or.. the dog! The vaults had been good to us, they had given us so much. We had come so far to witness the spooky history of the vaults ourselves and the spirits certainly didn’t disappoint. Everything I have written about above actually happened, and more importantly -it was captured on film. To be honest every time we run through our footage we seem to pickup more and more. 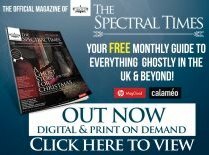 (such as EVP’s and strange shadows) – I seriously believe that we have many months of evidence to checkout before we can release our entire findings. 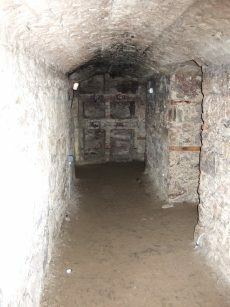 It must be said that even with all the hype of the Ghost TV shows, the vaults and its ghosts should not be seen as a truly frightening and evil place. The time we spent there, we felt nothing but intrigue and perhaps confusion. Even Mr Boot’s – who I had visions of throwing me around – is not the bad spirit that people have come to know him as. It was – and still is his home, you have to respect that. Lastly, a huge thankyou to Mercat (and Joyce!) – for the exclusive time in the vaults, it was an experience that we shall both carry with us for a long time to come.